If anyone knows anything about staying fit whilst throwing a punch, it’s Menay ‘The Emperor’ Edwards. With a strong right hook and a lightning-fast jab, ‘The Emperor’ is famous for knocking down JJ Ojuederie and claiming the Southern Area crown in 2013. 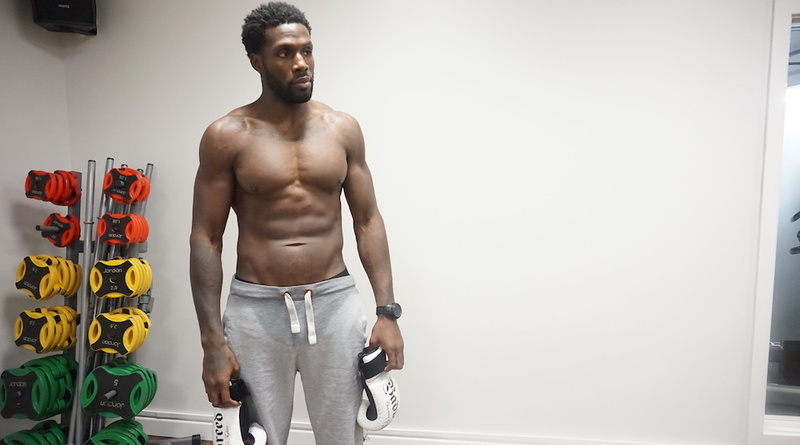 He’s also challenged for the English Cruiserweight title and boxed in the Harringay Box Cup, before being mentioned as a potential amateur fighter for the English squad. Now he’s turned his attention to personal training and is amassing a strong following of people who believe that boxing is the right way towards getting fit. Here are his top five boxing tips that will get you punching up a sweat like some of the best fighters out there. How to: Imagine yourself throwing punches against an opponent. You need to adopt a fighting stance, left foot forward, right foot back, fists close to your chin with your head slightly tucked in. Your strongest hand, which is often your writing hand, is always at the back. Step in front with the opposite foot. The hand with the foot out front will be your jab (your 1) and your strongest hand, or your backhand (your 2) the opposite. Find a strong head on vertical position that your body is comfortable with. You can now adopt a nice 1-2 punching rhythm. Don’t be afraid to step up the pace and throw in a hook or an uppercut. Just make sure to turn the waist, pivot your back foot and bend the knee if you’re throwing an uppercut. Benefits: If you’ve never watched a video of Floyd Mayweather shadow boxing, I strongly urge you to do so. It’s a fantastic exercise that helps you develop your agility, focus, and conditions your upper body muscles for sustained activity. It’s also a great way to begin your workout and warm up. As you punch, you rotate your waist and pivot your foot, so essentially you’re engaging a lot of muscles. As your heart rate spikes up, you’re pumping blood into every fiber which will get you ready for the activity ahead. Tip: Grab a 1.5kg dumbbell in each hand. The more weight you add, the more you’re going to be engaging your upper body muscles. If you perform upper cuts and hooks, you are engaging your waist and your forearms. How to: If you’ve ever watched Anthony Joshua train you may have noticed that he always sticks to one basic exercise. Skipping rope. Put on a bodysuit, a jumper, anything warm, and go grab yourself a skipping rope. Pick a flat surface and a long rope. Gently grip both ends of the rope. Start off by mentally practicing and timing your jumps. The goal here is to keep a fast pace and steady rhythm going. Benefits: Before you know it, you will be dripping sweat, burning calories and sending your heart rate into cardio heaven. If done right, the steady pace of up and down jumping should take your heart to between 120-140 bpm. Jumping rope is not just affordable and easy to do, but it’s also one of the most efficient ways for boxers and other top-level athletes to train. You’re improving footwork, endurance, stamina, quickness, coordination and burning fat at the same time. Tip: Adjust your skipping pace to your favourite music playlist. I usually aim to get through 5 Drake songs before I stop completely. How to: Have you ever wondered why boxers are so adept at taking body shots? Unless it’s a well placed shot to the liver, the odds are that a boxer’s core is rock solid. The trick? Lots and lots of sit up variations. The best sit up variation that Pacquiao and myself use is a punching one. Lay down on a flat and comfortable surface, bring your legs and knees together and proceed to go into the UP position. This means bringing your neck just above your tailbone as you go up. However, once you’ve reached the top of the movement, the key is to go into a punching 1-2 movement, much like the shadow boxing exercise. As you go into the DOWN position, make sure to take your hands back in and hold them by your side. This way, as you go UP, you extend your arms into the 1-2 punching motion and back down again. Benefits: When performing this exercise you are helping to strengthen and firm up the rectus abdominus muscles, your six-pack. This is the core of every fighter and the core of every well shaped physiques out there. You won’t be growing into a beast just yet, but you will tone your body and develop some much needed functional strength, something that heavy equipment oriented exercises just can’t provide. The twist as you come out of the punching movement at the top also engages your obliques, which means you’re directly affecting more than one muscle. Tip: If you have a punching bag, sit directly underneath it, and as you go up into a crunch you proceed towards punching the bag. The key here is to hop over to the left and right directly after punching the bag. You’re leaning in, out, left, right, hopping in every direction, meaning that you’re engaging your obliques and your core deeper than before. How to: Running is easy. Anyone can run. However, running with intent, focus and proper technique is reserved for those willing enough to shed off the pounds. Grab a sweater, a bodysuit, anything warm and you can either go out for a run or step up on the nearest treadmill. When you run, you need to think about pace and form. Always start slow and build up into a fast incline, about 10kph to 12kph. Any incline level will do, as long as you’re not just running on a flat surface. The form here is the key. Always keep your back straight, core tight and breathing active. By active, I mean that you should breathe in through your nose and breathe out through your mouth every 4 seconds. Before you know it, you’ll be losing calories fast, and will be celebrating like Rocky at the top of the stairs! Benefits: This is a tried and tested exercise. Running equals cardio, cardio equals gains. You’re heart rate and blood are working in tandem to supply your muscle fibres. One without the other doesn’t work. You’re building up your cardio, your endurance and stamina and your active recovery time. I also use this time to focus on visualising my goals, my workout, my running, and use that as fuel to guide me into my next workout. Having that mindset and amping myself up for the next workout is key to breaking that mental barrier. Tip: Breathe steadily in through the nose and out through the mouth. How to: Punching a heavy bag is not for everyone. It requires technique, constant awareness and a sharp, strong jab. First things first, purchase a pair of hand wraps and boxing gloves. These will protect your hands and knuckles from the impact with the bag’s rough surface. Follow the same shadow boxing techniques as explained above. Make sure to shuffle left and right, always keep your hands up and close to your chin and throw fast punches. WIthout the intent to throw a fast and strong punch, this exercise is a waste of your time. So, the key here is to go hard or go home. How many: 4 sets of 2 minute rounds with a minute rest between each set. Benefits: My favourite exercise of all. This is one of those exercises that works your body and your mind. You can unleash all your frustration, stress and anger into the bag, which does wonders for your mental health. You’re also building your strength, power, balance and core. You’re punching with intent, which means every muscle in your body is ready to help deliver that movement. Your core is engaged, your waist is shifting left and right, your upper body and arms are feeling the pain. Your bones and your ligaments are getting the most workout here, which is very beneficial. Tip: Blow sharp breaths out through your mouth when punching the bag and take deep breaths in through the nose in-between the gaps.